Beach Club, take me away! Oh, if I could be anywhere today...Disney's Beach Club- on Crescent Lake in Disney's Epcot resort area- is the place I'd love to be. I'm standing right there on the walkway, and I can almost hear the splashing coming from the Stormalong Bay pool complex, just off to the left. I think I also hear the low horn of a Friendship Boat, gliding by on the lake behind me. Have you been to Beach Club? Where would YOU like to be today? Sounds like a great way to escape for awhile Kelli :-) If I had my druthers I would like to be spending the afternoon at Downtown Disney, LOL. I was looking through photos earlier for the Favorite Food Friday hop at Disney Day by Day and came across some pics from Goofy's. Now I want some, LOL :-) Have a great weekend! We've never stayed at The Beach Club but I love The Boardwalk Resort next door. I love that you can walk to Epcot and take a quick boat ride to MGM! Just today we were working on our plans to take our grand children to WDW for their first visit next year! Beach Club is an awesome choice...it would definitely be in my top 10 list of places to be right now....but if I had to choose JUST ONE place to be right now....I would choose to be at the top of Teamboat Springs in Blizzard Beach! This is still my number one ride in WDW. My whole family loves the water parks - especially Blizzard Beach - and this is my favorite ride there. What makes it so awesome is that - unlike most other rides - my entire family (6 of us) can all do it, and we all sit together in a giant round raft. As we race down the slippery, fast, wet, wild ride, we are facing each other, seeing each other laughing and screaming and having a blast! On most other rides- as fun as they may - you are generally not facing the other members of your family, they are more of an independent experience. 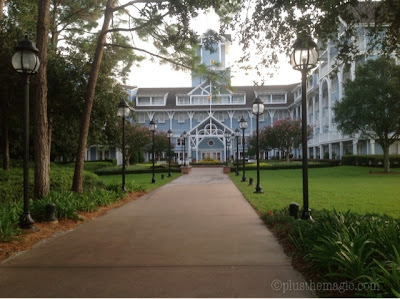 We didn't stay at a resort when we went to Disney, we almost wished we did because we drove back and forth from a friends house that was over an hour away. We thought the resorts would have been more expensive but most people don't realize that the resorts have perks that others don't have, such as meal plans. That place is the Poly for me, but yes I have gone there in my mind many a stressful day.